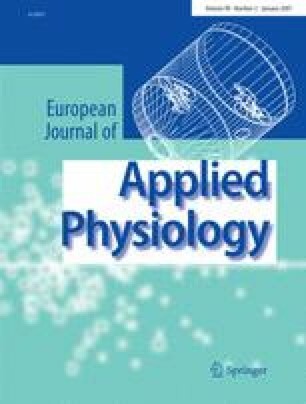 It has been concluded from comparisons of base excess (BE) and lactic acid (La) concentration changes in blood during exercise-induced acidosis that more H+ than La− leave the muscle and enter interstitial fluid and blood. To examine this, we performed incremental cycle tests in 13 untrained males and measured acid–base status and [La] in arterialized blood, plasma, and red cells until 21 min after exhaustion. The decrease of actual BE (−ΔABE) was 2.2 ± 0.5 (SEM) mmol l−1 larger than the increase of [La]blood at exhaustion, and the difference rose to 4.8 ± 0.5 mmol l−1 during the first minutes of recovery. The decrease of standard BE (SBE), a measure of mean BE of interstitial fluid (if) and blood, however, was smaller than the increase of [La] in the corresponding volume (Δ[La]if+blood) during exercise and only slightly larger during recovery. The discrepancy between −ΔABE and Δ[La]blood mainly results from the Donnan effect hindering the rise of [La]erythrocyte to equal values like [La]plasma. The changing Donnan effect during acidosis causes that Cl− from the interstitial fluid enter plasma and erythrocytes in exchange for HCO 3 − . A corresponding amount of La− remains outside the blood. SBE is not influenced by ion shifts among these compartments and therefore is a rather exact measure of acid movements across tissue cell membranes, but changes have been compared previously to Δ[La]blood instead to Δ[La]if+blood. When performing correct comparisons and considering Cl−/HCO 3 − exchange between erythrocytes and extracellular fluid, neither the use of ΔABE nor of ΔSBE provides evidence for differences in H+ and La− transport across the tissue cell membranes. The authors thank all test subjects for their willing cooperation and Mrs. J. Nadol for technical assistance.